The Computer Science Society is not even a year old yet and we are already starting to make big moves on campus. Many clubs fail for several different reasons, but a big one I see is lack of organization. Our club has a unique set of tools we use in order to stay organized and make sure we keep in contact with one another. We use several different applications such as Trello, Slack and Google Drive. Personally, I believe these have helped us make such a large impact on campus in the short time we have been here. We want to spread the knowledge and give everyone the opportunity to organize their club so, I have created a little guide to some of the common tools we use. make sections, such as the ones in the picture above. On our board, some of our main sections include “Things to discuss, Important, task and info”. All of these sections have specific “cards” that contain tasks we need to complete. On each of the cards, we have the option to assign due dates, certain people to a task and any little subtasks that need to be completed. Under “things to discuss”, we put anything that we believe we need to start doing. 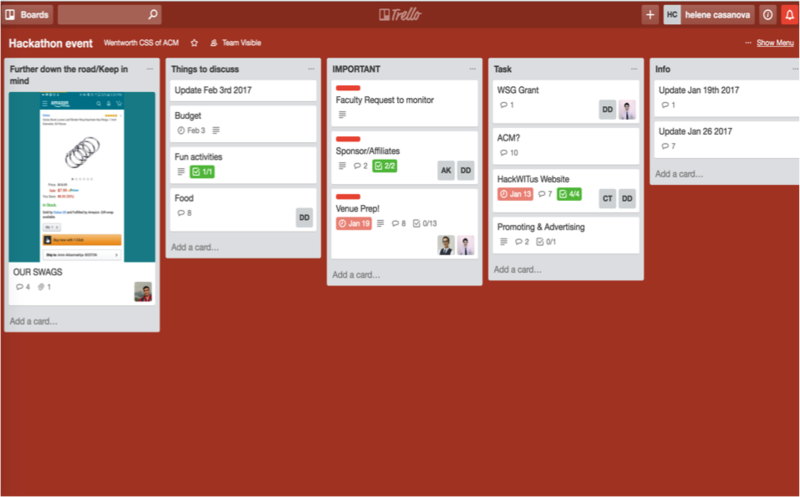 “Tasks” are current tasks we are working on and if we complete them, we can move the card over to the appropriate list. Everyone on our team can edit, delete, add or move cards as they are working so everyone can efficiently manage their tasks and no one person is doing too much work. Slack is a messaging application that lets you make different channels within your organization so you can communicate with your other teammates or friends. You have the opportunity to create and public channel and be able to communicate with all the members of your organization. Those that are public are preceded by a “#” while a private channel is preceded by a lock. The private channels give people the opportunities to talk in smaller groups and you can specify what specifically you want that channel to be. Below the channels are just some of the people you can direct message. If you want to have a private conversation with someone slack gives you that chance. Slack is the best way to communicate for the e-board because we all have different cell phones and Android phones require you download any group messages so, the only people that would benefit from that would be IPhone users. Slack is great for both mobile and desktop. I have to say that slack is one of the many messaging apps that has an amazing desktop interface as it does app. Slack also lets you turn push notifications on or off so, you do not have to worry about the pesky notifications. Another benefit to slack is its ability to upload files. Instead of having to email or find a way to get a file to a team, you only have to post it on the board and it is accessible. Google Drive is a cloud service to store you files and be able to easily interact live with other people editing a file. The CSS has made a folder that all the e-board members can access in order to obtain important documents that pertain to our club. This is where we keep our attendance list, budgeting information, meeting notes/agenda and other files pertaining to our club. Each member of the e-board has a specific folder they frequently use. Mine would probably be the attendance/meeting note folders as I am secretary. We also have standard naming conventions for all our files. We do this just in case a file is put in the wrong place we can navigate it to the right place and so we don’t have to wonder if a.docx is todays notes or if a1.docx is todays notes. Instead of the guessing game, we would use something like this: meetingNotes_01112017.docx. We can see what it is and the date it was written.